Everyone in my house has been ill with a thing called norovirus. It’s not particularly pleasant but it’s reasonably amusing. It keeps the staff diverted so it does some good. I’ve got it worse than anybody else because of the boring history you know about - the poisonous oyster and the E coli I picked up from a steak tartare last year, which weakened my system so much I’ve been in hospital eight times in the past few months. The thing about my house is there is always noise going on outside. There always seems to be something happening that I would rather did not happen. There are trees being felled, people in the garden, work going on next door, work going on in the street. It’s irritating. So I am grumpy and bored. I don't read books. I don't watch television much except programmes about Hitler. 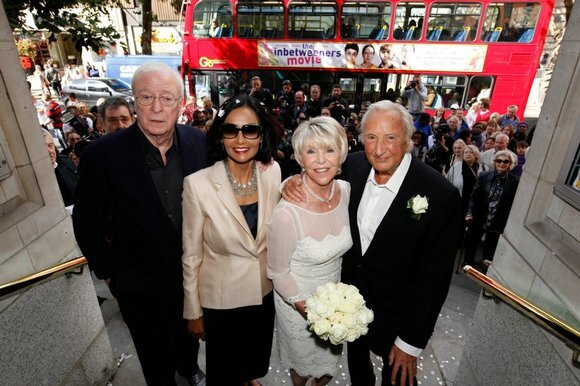 Michael Caine, Terry O’Neill and John Landis have been to visit. Who’s putting up with me? Geraldine. You know that after 70-odd years of bachelorhood I married Geraldine last year. During the wedding, the registrar asked if anyone knew why we should not be married. I said: "Well, I'm not too sure." I was right when I once said that on a good day Geraldine puts Hitler and Genghis Khan in the shade. Marriage hasn’t made a lot of difference to my life except that I now say “Yes, dear” and “Darling, you’re absolutely right” much more than I used to. So this is it: goodbye. I’ve been writing this column for nearly 20 years and I don’t want a carriage clock or a gold watch. I am trying to get rid of stuff, not collect it. When I think back over the best things I’ve written about, I think of my divorcey-moon with John Cleese after he split from his third wife, Alyce Faye, and had to pay her millions. That’s what always put me off marriage: a neon sign above every girl’s head, flashing the word “Alimony”. We set out for Lucerne. He drove. I navigated. We lunched at the hotel St Wendelin in Greppen on Lake Lucerne. Marvellous fresh fera fish from the lake. Idyllic view of meadows, little chalets, the lake and mountains. When I came out John was in the car. “As you’re the driver you should open the door for me,” I said. “I did open the door - that’s how I got into the car,” he responded. “So has Alyce, thanks to you,” I replied. The experience wasn’t enough to put him off: he got married again. Don’t be fooled by me either. I love to think of my honeymoon with Geraldine at the Hotel Splendido in Portofino. Marvellous food, hospitable and capable staff, the greatest view in the world: a pine-covered hill, an old castle, the harbour and the Ligurian coast. Portofino, a fantastically preserved port, houses the best Italian restaurant in the world, Puny, run by 80-year-old Luigi Miroli. We started with scampi caught that day. The texture, unlike the over-travelled, rubbery stuff you get in London, was perfect. Then flat pasta with a brown sauce. Delectable. Followed by baby octopus, which I normally hate. Then sea bass cooked in salt. Everything had a memorable flavour. We both like to spend Christmas at the Gstaad Palace. A huge lounge with log fire and mountain view. A couple of years ago we saw Roman Polanski handing out DVDs of his film The Ghost, Sir David Barclay and his beautiful wife and a parade of interesting visitors plus a great gypsy band. Lightning service everywhere. What a hotel. For New Year’s Eve, usually a disaster, it had 730 diners. Beyond belief efficiently dealt with, service impeccable, great food, more caviar than I’ve ever seen, lovely entertainment, no drunks. While I was there I booked for this Christmas and new year. Who knows, after Christmas I might make a comeback. How many times did Sinatra do it? When you have sold out of Hymie books, will you publish a book of the letters sent in by Nick Jones of La Drome? How lovely to see the photo of Geraldine at Shepherd’s with the youthful-looking waxwork of you that she must have borrowed from Madame Tussauds. I trust she didn’t have it seated next to a radiator. How about this for an amusing translation spotted on the dessert menu of a restaurant in Ravello, Italy? "Raspbelly foam." Can't wait to try it. I realise The Sunday Times likes to print the letters insulting you, but who are these people compared with your good self? What have they done in life (apart from having their name printed in your column) compared with your achievements? The Big Sleep and "Calm down, dear", to name just two.